we have a cancellation policy of no refund on the booking deposit or booking fee for a cancellation, no show or reduction in numbers. 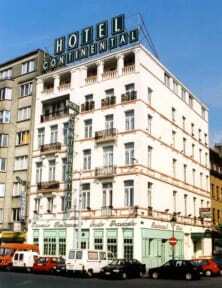 Hotel Continental is located in the heart of Brussels, 200 meters away from the Midi Station, where the trains of Thalys and Eurostar stop. The closest metro station will lead you directly to the city center, to the european headquarter and the expo area, accessible at the same distance. Free wifi connexion is available in the room as well as in the common areas. Each room has a desk, a private bathroom with a shower or a bathub, hairdryer and free toiletries. You 'll enjoy a view of the city from your room . Ironing equipment is available upon request. 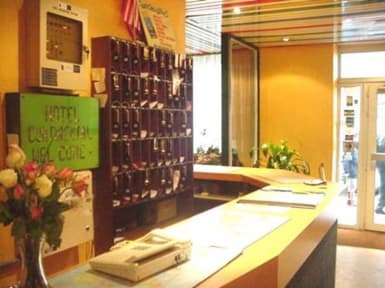 Hotel Continental also has a 24 /7 reception. You can also benefit from luggage storage and vending machine. Grand Place and Manneken Pis are only 1.2 km away. Finally, Brussels Airport , which can be reached easily by train, is 12 km. This area (Saint-Gilles) is an ideal choice for travelers who are interested in these topics: shopping, architecture and food. The latest renovations have been done in mid-2015. What a charming place in such a convenient location, with wonderfully welcoming staff. Would not hesitate to stay here again! Great value for money and convinienxe for midi station. The hotel is old but it works well, and the staffs are very kind. Good choice for a short stay. We stayed for one night with my wife after Tomorrowland ended, and we needed something close to Gare du Midi (Zuid/South), because we had a train on the next morning to London. It was really close, and you have great connectivity thanks to the station (if you want to go the Ghent and Bruges this is your place!). The staff is really friendly, but don't expect something luxurious. Ok hotel to stay at, maybe not for families, ok for friends and couples backpacking. Very friendly staff, bathroom in our room was fully equipped and everything was really clean. I stayed for one night, so I don't have a much impressions. Location is good and I got a room with bathroom, even it was written that bathroom is shared. It is clean, but furniture is pretty old and fashioned, but I didn't expect more for this price in Brussels. Very handy to Eurostar and Metro and 15 minutes walk from the tourist centre. Basic and comfortable. No kettle in room and shared toilet/shower across the hall from the room. We had breakfast elsewhere as the price was similar and choice was better (who could turn down a waffle elsewhere?). Front desk check-in was very nice, but after paying, settling in, and walking around the area outside, I did not feel comfortable staying here. I was traveling with my younger sister and staying in Brussels for several days. We decided to stay else where. We were not able to get our money back, but felt so much safer and relaxed in a different place closer to the city center. Perhaps okay for a one night stay. Other than that, I advise spending a little more money for a nicer area and comfort. The hotel was unsafe, a drunk guy almost barged in our room aftermidnight. Staff were not prompt or up to standard and they didn not act professionally most of the time. The neighbourhood is awful, noisy, and unclean, however, it is near to Gare Midi station. Not recommended.